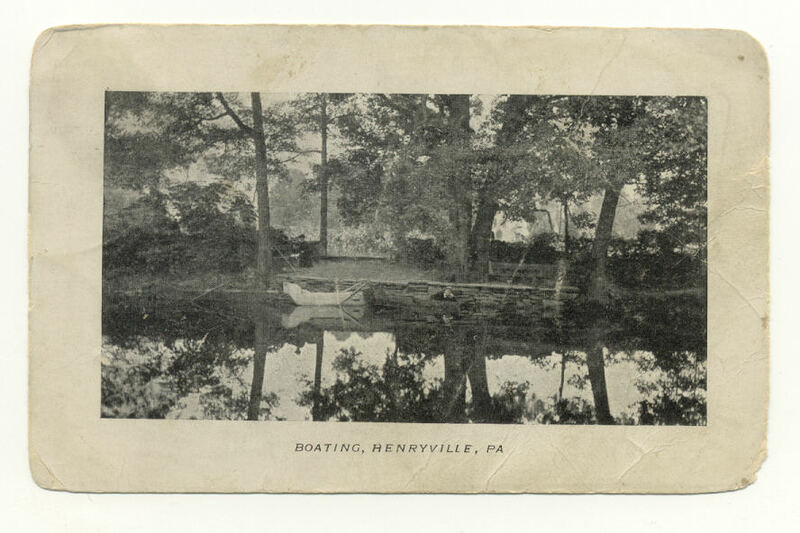 Boating at Henryville, PA - old postcard postmarked July 24, 1908. 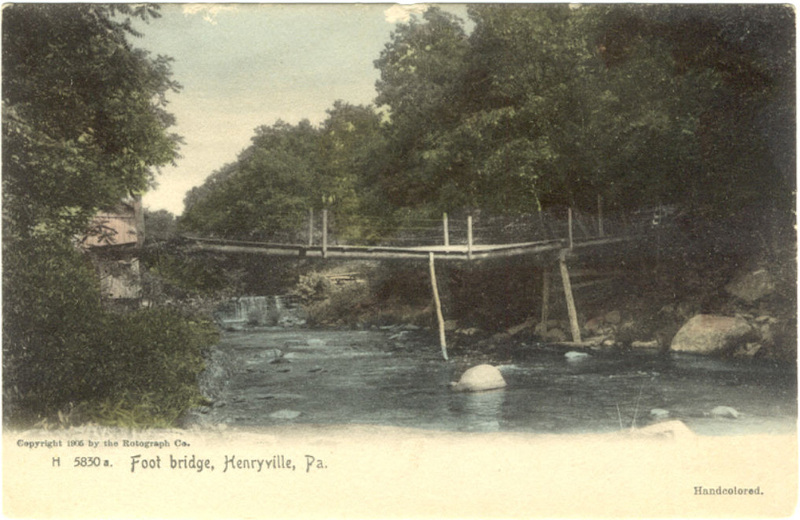 Barefoot Huckleberry (with cousin George visiting from Cleveland) riding mule pulling barge up the Delaware Canal. 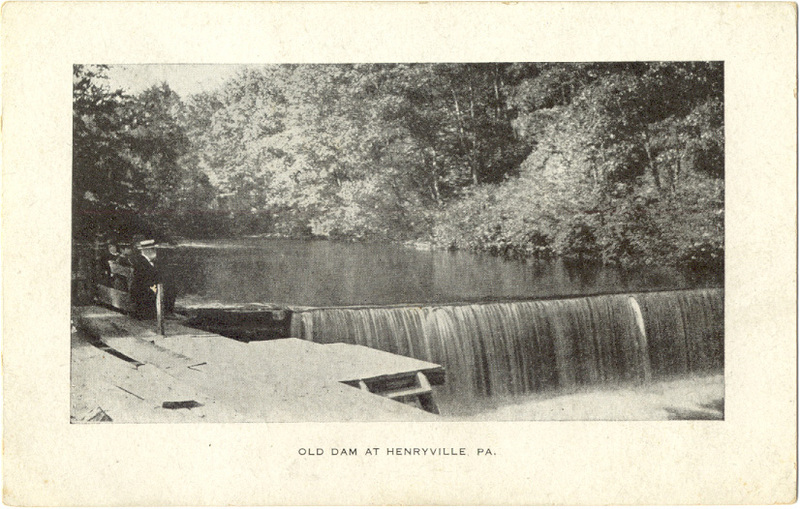 Old mill dam in Henryville. 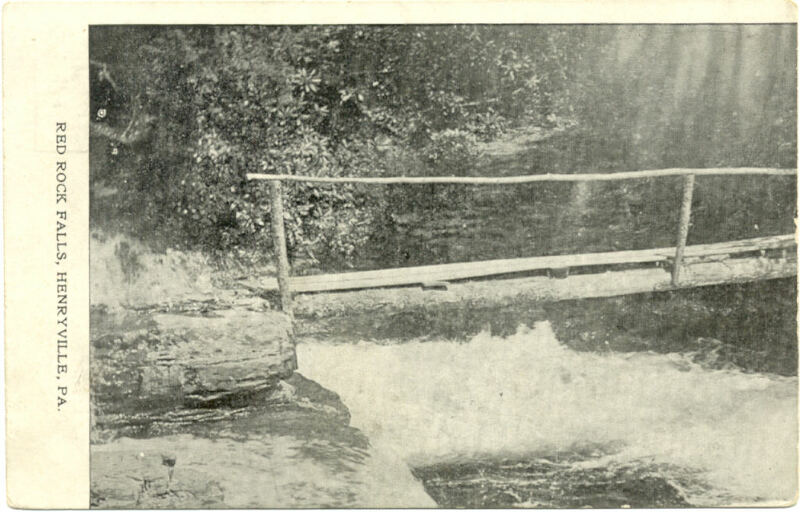 Footbridge located downstream from old mill dam in Henryville. Fun in the Old Slab Hut at Henryville Lodge. 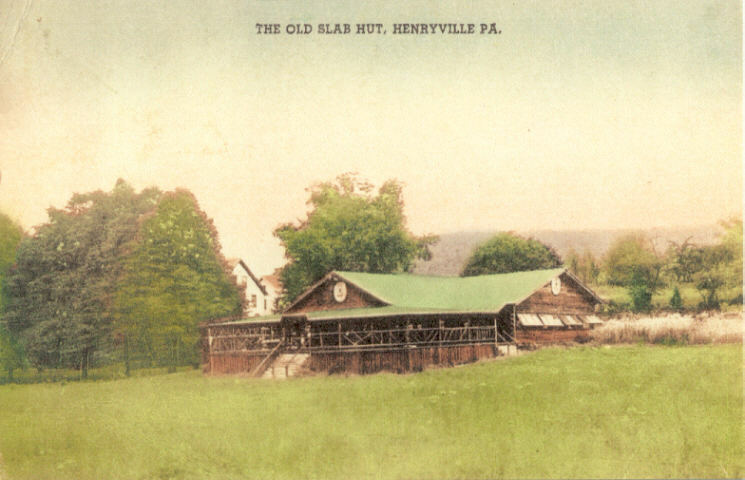 The old Slab Hut, Henryville Lodge &amp; Cabanas. 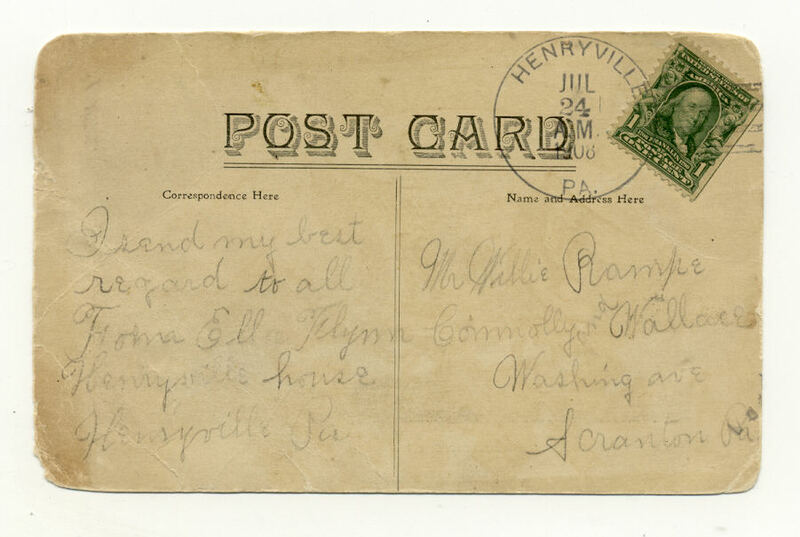 One of my fondest memories of those long ago summers at Henryville was about a thirty-something guy on staff named Mac (90% certain his name was Macalthough I must admit my memory is a little hazy). Mac was at Henryville only one of the two summers I worked there. I think it was the summer of 1964. 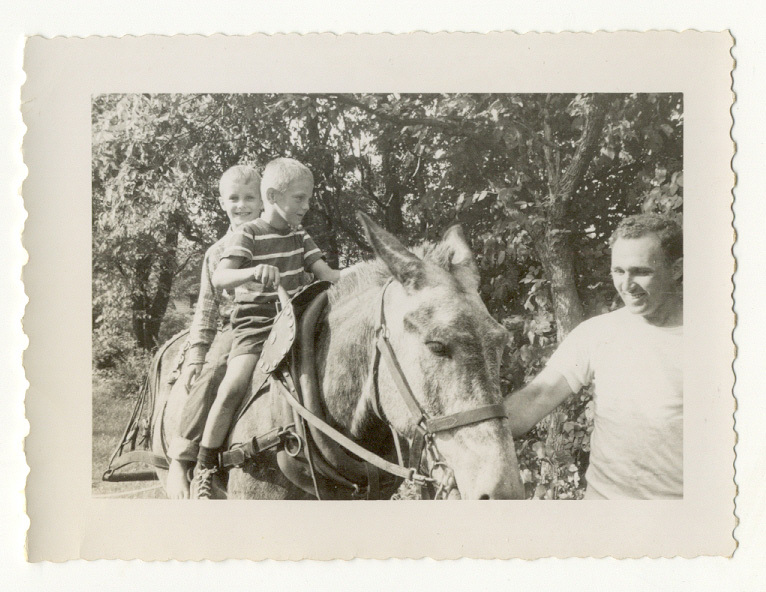 Mac was hired in mid-summer as a kind of roving troubleshooter for the lodge, not for problems with vacationing guests but instead to intervene, like a foreman, in problems or disputes between/with worker staff. 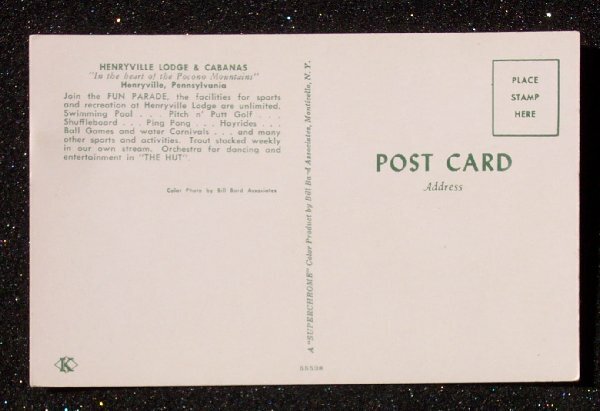 To explain why the owners/operators of Henryville Lodge in those days (Alvin &amp; Eleanor Ziegler) felt it necessary to bring someone like Mac aboard, I should take a moment to describe the situation with two or three of the waiter/kitchen staff prior to Mac's arrival. In that summer of 1964, we had two brothers on staff - mean, bullying SOBs named the Doan brothers (from Scranton, I think) who used to make life generally unpleasant for the rest of us staff housed in the male worker dorm called Bedlam. The bigger, more intimidating of the brothers was a dishwasher. The other was a waiter and therefore had to sufficiently clean up his act (at mealtimes anyway) in order to interact appropriately with vacationing guests. I distinctly recall an incident where Mr. Ziegler came to the kitchen to see how things were going. As Mr. Ziegler stood in front of dishwasher Doan observing his job performance, this Doan brother decided to challenge the lodge owner right there in the kitchen, deliberately slamming and breaking plates on the concrete (and regularly mopped) floor. Mr. Ziegler told him to stop, telling him right there on the spot that he was fired. I remember then that this Doan brother responded with something like, "X#@%-you, make me! ", at which point, Mr. Ziegler exited the kitchen. Some days later, this guy named Mac showed up. Many of us were a little puzzled as to why he was there, what his role was. He got rid of the Doan brothers in short order, I do remember that. However, before leaving, they took a few minutes to trash Bedlam one more time, completely tearing out the homosode material hallway walls of their room, meaning that any future occupant of that room would be fully exposed to the hall. It's easy to picture this. When walking down the long, dimly-lit hallway of Bedlam, you would come upon the Doan brothers' room which would now be more like an open space (like a lobby) with door frame and door intact - but no wall on either side of the doorway. Real animals, the Doan brothers. I have to wonder, more than 40 years later, whatever happened to those two guys. It was clear to all of us back then that this guy Mac made a conscious effort to cultivate an image as a lone wolf. Now that I myself am in my late 50s, I can look back on this and fondly chuckle at all of us worker staff. Most of us were a bunch of wide-eyed, impressionable young guys - most of us in our mid to late teens, impressed with this 30-plus year old guy named Mac, possibly having a military background (lending even more mystique to his image since this hinted at survival and self-defense training), this lone wolf just suddenly appearing at the lodge one day out of the blue - no apparent family ties, alone - going around carrying out his big brother troubleshooter duties. He quickly succeeded in winning many (indeed most) of us over. More on this - this sense of a growing loyalty to Mac - in a moment. But to hit on a sidelight, I distinctly remember Mac's love for the memorable, whistled theme song from the 1950s hit movie "The High and the Mighty". Mac could often be seen roaming the grounds of Henryville Lodge in his beat-up brown leather flight jacket, day and night, whistling this lonely loner music - to himself, all the time. I think he liked to picture himself as a lone gunfighter who simply arrived one day at the O.K. Henryville Corral, ready to take on the bad guys and bring order to the peace-loving peoples of Henryville. We all felt a certain affection for Mac, never mimicking or laughing at him - but instead, letting him have his silent, daydream space - along with his High &amp; the Mighty tune. Although Mac was broad-shouldered and husky, he was not tall, perhaps 5'9" or 5'10" He never said so, but it almost seemed as though it may have frustrated him a bit to be shorter than the hero of that hit movie, John Wayne. Regarding the rest of us and our sense of loyalty to Mac, my final memory of Mac at Henryville is one particular summer evening when Mac returned to the lodge from a sortie he taken somewhere off grounds in his car. He was very badly beaten up, much like the saying "beaten to a pulp". We all gathered around him, worried about him and wondering what had happened. He told us he had been jumped by a bunch of no-good SOBs from another resort/lodge, meeting these guys in a bar somewhere. According to Mac, things got ugly when he told them they were a bunch of @#%$holes who couldn't stand up to us Henryville guys. Then he said these guys who beat him up told him they were coming for us that very evening, to take on us supposedly bad-bottom Henryville guys. It's at times like those that one wishes animals like the Doan brothers hadn't been fired. In any case, that was all the encouragement any of us needed. We each grabbed something, anything - a baseball bat, a piece of 2x4 - and as evening approached, spread out on the perimeter of the Henryville grounds (along Highway 191 or Route 715) and waited behind trees or out in the open, waited for these unnamed guys to show up, standing ready to defend Henryville territory. 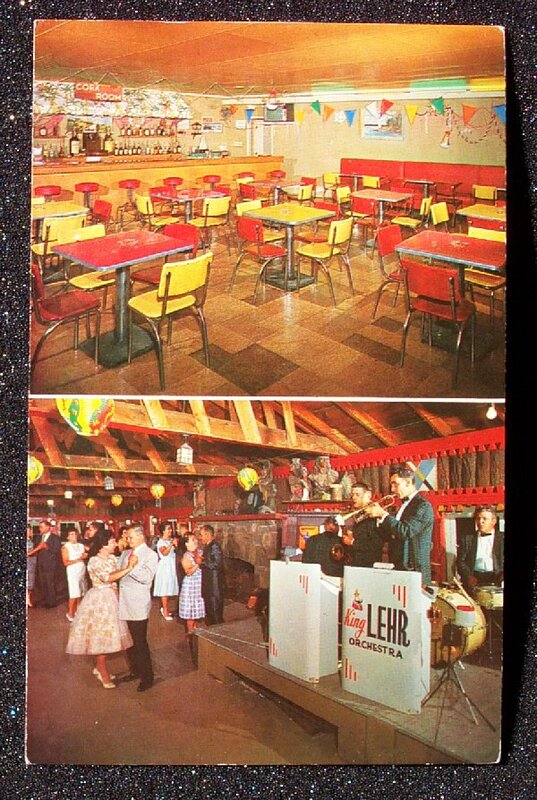 I myself was there, out by Highway 191 - other staff worker friends within earshot of one another. The late evening stretched into full-fledged night - and still no one showed up. I'm not a complete ****... so, at one point, I spoke with a staff friend standing nearby and the two of us thought, "How stupid are we? To stand here ready to do battle with clubs against guys we don't even know, to defend Henryville Lodge?" Suddenly it seemed like the height of idiocy. The very place which made us move back into stinking Bedlam quarters the very day it suffered a frightening fire, the place which never gave us a day off from work the entire summer - to stand there with clubs ready to do battle - all because of some loyalty and anger over what had happened to Mac. As much as we all liked him, how could Mac get us involved in a battle of his own making? Still though, we stood our ground, ready to defend Henryville - until it got so late it was obvious no one from some other lodge-resort was going to show up prepared to do us in. I think the hour we decided to cease and desist was so late that we were all a little bleary-eyed serving guest breakfast the next morning (7:30 AM). My memory of Mac's departure is a little hazy, but I'm pretty sure he didn't last much longer after that incident. I guess he just melded away into the lonely night, whistling the theme song from The High and The Mighty.